These easy crispy Zucchini chips are literally the easiest snack to prepare. 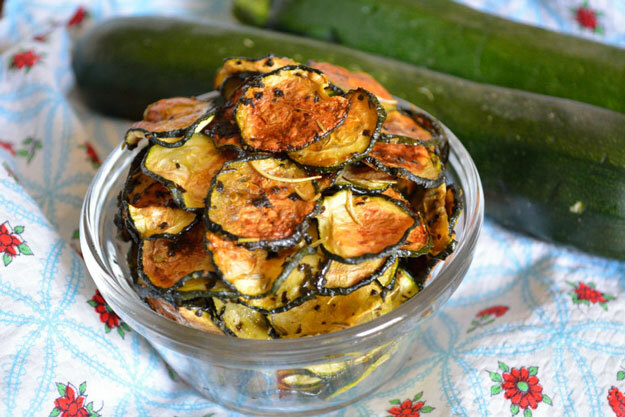 Just slice a zucchini really thin, deep fry or bake the slices and season with salt – that’s it! Plus, you can store them for up to 3 days. So what are you waiting for? Try them out NOW! Wash the Zucchini thoroughly and let it dry out. Using a slicer, slice it really thin. Place a paper towel on a plate and spread a few slices on it. Place another paper towel on top and then using your palms, press the slices so as to squeeze out the liquid from them. When the liquid from all slices has been squeezed out, keep them aside and put a deep frying pan over high heat with olive oil in it. As soon as the oil heats up nicely, lower the heat and carefully slide the zucchini into the oil. Fry until crispy and golden colored on both sides. Then transfer to a plate lined with paper towels to soak the extra oil. Sprinkle salt over the chips once they’ve cooled a bit. Then gently shake them to dust off extra salt. Store in an air-tight container for up to 3 days. Serve with choice of beverage.